Sri Ramnavmi Utsav at the Ashram ( April 3, 2009 ): During Holy Chaitra Navratri, a group recitation of Holy Sri Ram Charit Manas Parayan continued from March 27, 2009 to April 3, 2009 . On April 3,2009 Holy Sri Ram Navami , Birth of Lord Sri Rama was celebrated with great devotion and enthusiasm at the ashram. Sri Hanuman Jayanti ( April 9, 2009 ) On April 9, 2009 A full moon day Holy Sri Hanuman Jayanti, a birth of Lord Hanuman was celebrated at Sri Dukh Bhanjan Hanuman temple of Ashram. A Maruti Yajna with Archana and Path of Sunderkand was organized and great number of devotees participated in this special worship to the Lord Hanuman. Srimad Bhagvat Saptah (April 13, 2009 – April 20, 2009 ) Holy Srimad Bhagavat Katha was organized at Ashram’s Sri Sri Sri Ashta Laxmi Bhavan. Pujya Sri Swami Adhyatmanandaji was on Vyasasan and daily discourses from 3.00 P.M. to 7.00 pm by Swamiji enlightened the large number of devotees In the episode of Lord Sri Krishna’s birth and His wedding were celebrated with great devotion and enthusiasm. 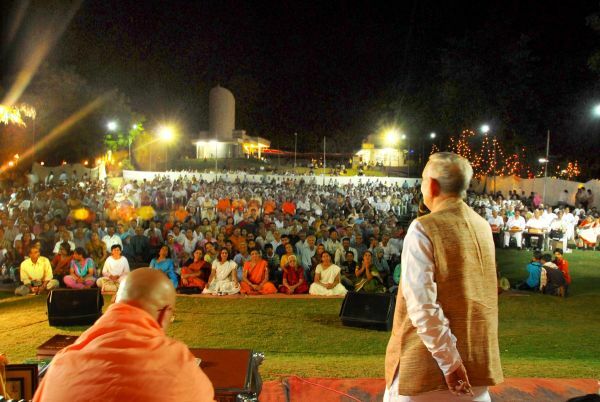 On April 17, 2009 Sri Swami Adhyatmanandaji Maharaj addressed a large gathering of Femina Club of Lioness Club of Ahmedabad. Sri Swamiji spoke on the subject of “Need of Spirituality in Household Life”. The session of question and answer was very lively and interesting. From 28th April “Utsav Triveni” commenced with great and deep love for the Lord. On 28th April Holy Birthday of Sri Adi Sankaracharya was celebrated by remembering him and his teachings of Vedant. 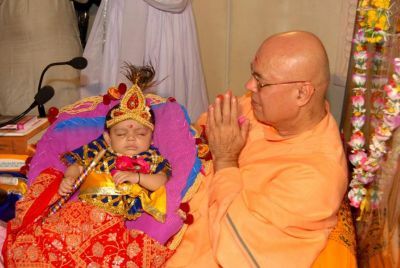 H. H. Sri Swami Viditatmanandaji Maharaj (Acharya, Tatva Tirth, Ahmedabad), Dr. Swami Muktanandaji Maharaj (Todarpur, Rajasthan), H. H. Sri Swami Adhyatmanandaji Maharaj, Rev. Swamini Vidya Prakashananda Mataji, Brahmacharini Divya Prem Mataji of the Divine Life Society, Kendrapara (Orissa) expressed their thoughts and teachings of Sri Adi Shankaracharya. On April 29, 2009 Brahmotsava of Sri Sri Sri Ashta Laxmi Bhavan and Sri Swami Chidananda Yoga – Dhyan Mandir was celebrated with early morning Sri Yantra Pooja, Sri Navchandi Yajna, Bhandara and holy hymn singing in praise of God as mother by Sri Ajay Yagnikji of Delhi. 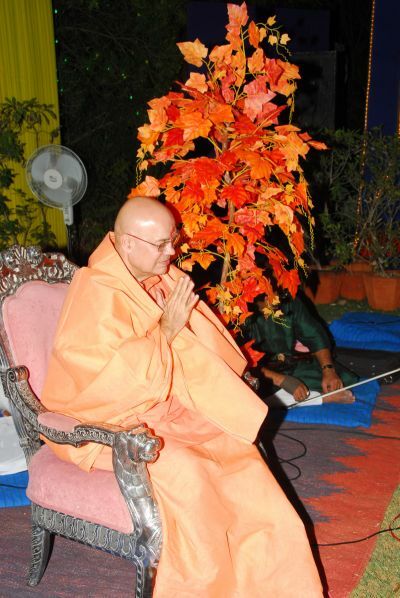 From April 30, 2009 to May 3, 2009 was a special at the ashram on the occasion of Pujya Swami Adhyatmanandaji Maharaj 65th Birthday celebration. Daily 9.30am to 11.30 am and from 4.00pm to 6.00 pm group chanting of Maha Mrutyunjaya Mantra japa was performed at Sri Ashta Laxmi Bhavan by large number of devotees. On 30th evening from 8.00 to 9.00 P.M. Dr. Swami Muktanandaji Maharaj gave soul elevating discourse that was followed by a spectaculars dance Ballet ‘NARI’ in Bharatnatyam style by artist of Nrutya Bharati, directed by Sri Chandan Thakore. They performed number of other presentation with great deal and depth of esthetic sense. On May 1, 2009 evening most worshipful and revered. Dr. Anantananda Mataji of Vehlal (Gujarat) poured her heart full of love for Revered Sri Swami Adhyatmanandaji Maharaj praised Pujya Swamiji contribution to the humanity. Also light music by Sri Nayan Pancholi and classical devotional music by Pandit Nirajchandra Parikh, which continued until late. 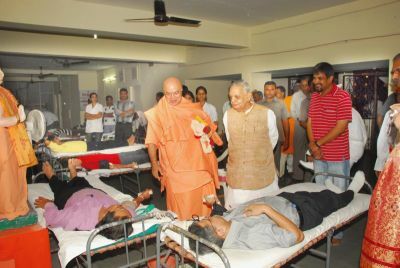 On May 2, 2009 Birthday eve of Pujya Swamiji Maharaj, renowned Bhagavat Scholars Sri Bhagavat Rishi from famous Bhagavat Vidyapith, Sola graced the occasion. He expressed his great regards & reverence for Rev. Sri Swami Adhyatmanandaji Maharaj. Devotional music and folklore by Smt. Trupti Chhaya and Sri. Dharmanshu Raval captured the crowd up to midnight. At 12.00 am hours devotees felicitated H. H. Sri Swami Adhyatmanandaji Maharaj. In Brahma Muhurta of May 3, 2009 a prayer and meditation session was organized with the large number of Yoga students of ashram’s regular yoga classes. Rev. Sri Swamiji was led to all Holy Shrines and temple ceremoniously with Vedic chants by learned scholars and Pandits. From 7.30 to 10.00 A.M. there was Aayushya Homam was performed at the Yajna Shala in front of Sri Vishvanath Temple. Mid-day grand lunch (Bhandara) was served to all. In the afternoon, Board of Trustees meeting of Gujarat Divya Jivan Sangh was held. Also a Blood Donation camp was organized in the evening from 6.30pm to 8.30pm. Evening session of May 3rd commenced with Ms. Himalee Vyas’s memorable vocal music. 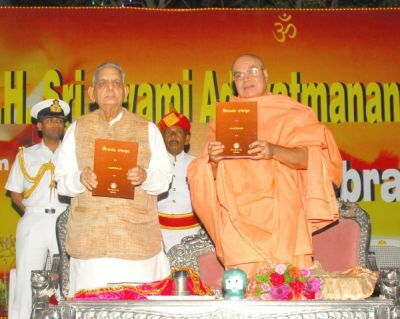 “Gospel of Swami Sivananda” and “Jivan Yoga” two Gujarati books were released by H. E. Governor of Gujarat. H. E. also awarded Dr. H. L. Trivedi (Director Kidney Hospital, Ahmedabad), Dr. Anil Srivastava (Cardiologist) of Sri Ram Manohar Lohia Hospital – Lucknow (North India), Dr. Mrugank G. Merchant (Orthopedic Surgeon, Baroda) with title of ‘Manav Bhushan” for their deserving service to humanity. Dr. Naren Joshi (Family Physician) Bhavnagar, Dr. Ashok Baxi (Pediatrics) Bhavnagar, Sri. Arvind Mehta Director of Ashakta Ashram, Hospital, Surat, Sri. Prabhunath Rai International President of Bhojpuri Samaj, Lucknow was awarded with the title of ‘Seva Ratan’. Renowned Yoga Teacher Sri Vinay Kohli of Karma Yoga Association, Karnal (Haryana) was honored with the title of ‘Yoga Ratan”. Disciple of renowned vocal maestro Pandit Jasraj, Pandit Nirajchandra Parikh was honored with the title of ‘Sangeet – Vibhushan’ and Sri. Hariharbhai Kapdi (Bhavnagar). Smt. Mayurika Oza, Sri. Nayan Pancholi, Ms. Himalee Vyas and Ms. Aishwarya Majmudar (Chhote Ustad, Amul Star Voice of India) were awarded with the title of ‘Sangeet Ratna". H. E. Governor of Gujarat Pandit Nawal Kishore Sharmaji in his speech expressed his overwhelming feelings and said that I always feel delighted with the name of Sivananda Ashram. Sivananda Ashram is a hub of Sanctity, Peace and Serenity. 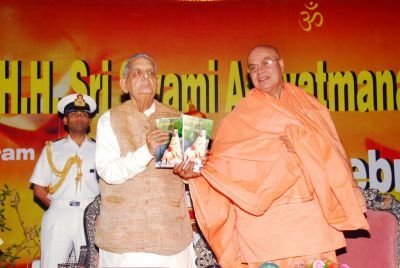 Revered Sri Swami Adhyatmanandaji Maharaj is a source of inspiration. Whenever I meet Sri Swamiji I feel delighted and experience inner peace. I have moved around the Globe. I have met number of learned and scholarly persons but Sri Swamiji Maharaj is unique. Service done to the mankind in general and the Gujarati Community in particular by printing and distributing Sivananda literature and that too a very economic rate are simply great. Also recognition of number of doctors, musicians and selfless service persons is honorable. In early days King used to do this kind of jesture. Now Government should do, but Swamiji’s way of social reformation and recognition to admirable persons from Haryana, Uttar Pradesh and of course from Bhavnagar, Surat, Baroda, Ahmedabad etc. is unique. My all best wishes to Sri Swamiji Maharaj and at the same time I seek Thy grace for rest of my life that up to my last breath. I, am also inspired by Sri Swami Adhyatmanandaji Maharaj live in the Spirit of Selfless Service. Vocal music by Ms.Aishwarya Majmudar (Chhote Ustad, Amul Star Voice of India) enchanted all the listeners present up to late night. After cutting the cake and having sung “Happy Birthday song” devotees disperse with divip ne experience and great peace at the heart. Nainital : ( March 30, 2009 - April 4, 2009) 99th Birthday of Respected Sri. Bankelal Kansalji, a great freedom fighter and a dedicated and committed Arya Samajist was celebrated with great serenity and pious atmosphere at Arya Samaj Nainital, as well as at Sumitra Sadan of Mallital , Nainital. Srimat Swami Adhyatmanandaji Maharaj and Sri Bankelalji have work together hand in hand for protection of Himalayas, prohibition of drug abuse, Tree Plantation and for many more project during 1975 to 1985. Rev. Swamiji spent full five days with the Kansal family from March 30, 2009 to April 4, 2009. 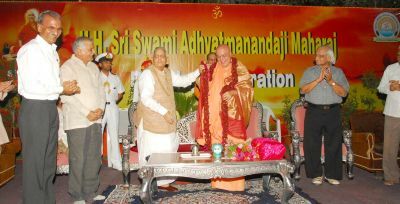 Delhi : On April 5, 2009 H. H. Sri Swami Adhyatmanandaji Maharaj arrived in the morning. Sri Swamiji conducted Prayer and Satsang meeting at Sri Anjani Nandan Sharanji’s abode at Lodhi Road, Delhi. It was a stop by visit on the way to Beijing, China. He left at night to Beijing. Beijing (China): (April 6, 2009 - April 12, 2009) Honoring long standing invitation of Nirvana Yoga of Beijing, Sri Swami Adhyatmanandaji Maharaj visited for a week long program here in Beijing.Swamiji was received at the airport by by Yogi Thomas Kao and other members of Nirvana Yoga. Floral welcome was accorded to Swamiji Maharaj. During his stay, Sri Swamiji Maharaj addressed two conferences of All China Yoga Teacher’s Federation organized by Nirvana Yoga. Sri Swamiji conducted on practical workshop for Olympic Players also. Om Shanti!